What is the addon i have to use? I'm playing 1.12.2 now and it has had Waila for the last few weeks. I think I installed Waila Harvestability from the Twitch client and it auto installed regular Waila too. I am looking in the files section right now and there is no 1.12.2 download. Are you sure it was Waila and not Hwyla that was auto installed? Will there be a version for 1.12.2? I'm playing on 1.10.2 with WAILA, and I am unable to see any metadata. It says the feature is < Unimplemented >, regardless of what block/item I am looking at. I don't remember ever seeing this before. I have played a lot of 1.7.10 lately, but I don't recall this feature being unimplemented in 1.10.2. Anyone else noticed this particular problem? I have WAILA, Waila Harvestability, Waila Plugins, What Are We Looking At, and I Can See Everything also installed. I wouldn't expect it to make a difference because the show metadata feature is part of the main WAILA mod. The other related mods shouldn't affect that. Edit: I was able to find at least two different posts (Issue #291) about this issue on WAILA's BitBucket bug tracking page. Unfortunately, this means it's not a bug on my end but simply something the developer hasn't added to this version of WAILA yet. So for that reason, I'm leaving this comment here in the hopes that it encourages @ProfMobius to implement this feature into the 1.10.2 version, and to inform other users and hope they also encourage the dev to add this feature. I've looked everywhere i can think of already, so I'm going to just post this here. I'm using the most recent version of Waila, and while I'm running other mods this issue persists with Waila alone. here's the problem. When i play Minecraft I put the graphics to fast, weak computer, and that effects leaves by filling the see through parts with a black texture, so you can't see through them. When this is active, and ONLY when Waila is on screen, these black parts of the leaves basically are replaced by the sky texture. They don't become see through, they're just sky colored. It looks atrocious and i know it only happens with Waila because without altering anything, JUST pressing 1 to hide Waila, the bug toggles just like Waila. don't look at a block, leaves are normal. Look at a block, leaves are bugged. Look at block and press 1, leaves go from bugged to normal with the key presses. Changing to fancy graphics in settings only half fixes this as well. Instead the bottoms of the leaves get an ugly blue tinge...plus, again, crap pc can't afford the fancy graphics. Could you do what you did with Animania(Showing animal hunger and stuff) for my realistic Polar Bear Mod?? Such as showing food/thirst and maybe age? I will start working on my first mod soon after I learn MC mod coding a bit more as I am a new mod dev. Some important info for users before you install! If your console log gets filled with tooltip errors and lags occasionally you need to use Hwyla instead of Waila. Hwyla is a fork of Waila. This is because you have other mods installed that assume that you are using Hwyla. When they're trying to use functions that don't exist in Waila you get console error spam and occasional lag because the error log is being filled up. Use Hwyla instead of Waila for now until Waila development has been resumed! This applies to version 1.11.2 as well! Hope this was helpful! Cheers. 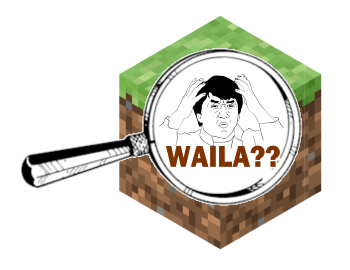 Does this also apply to some blocks from vanilla and/or mods showing up as Air in the Waila popup? That happens to me a few times while playing. What is the difference between Waila and Hwyla? (Other than what version of Minecraft they are available for; they are both available for 1.11.2.) Do they conflict with each other if both are installed? Hwyla is available for 1.12. In the future, don't ask mod authors for updates. They do this for free in their spare time and some mods take months to update. Who are you to give me orders? I know full well how this works. I suggest you spend your time learning some manners before ordering anyone about.